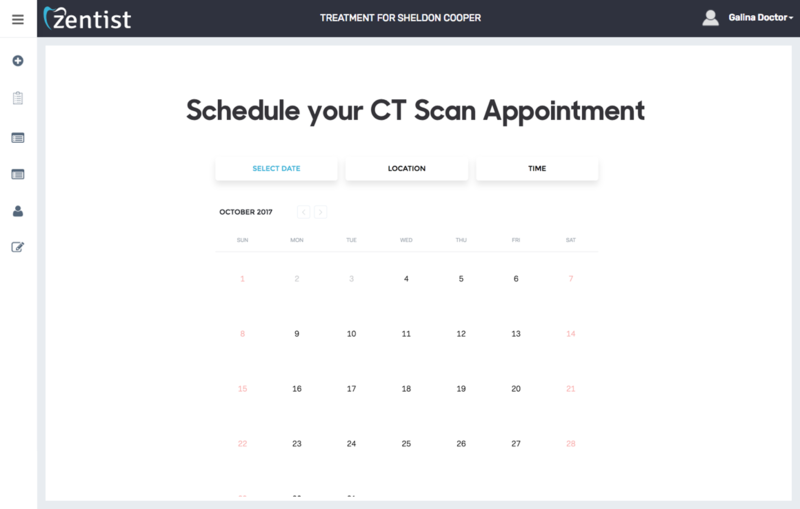 Book a CT scan appointment for your patient in under 2 minutes by logging in to your Zentist Dashboard. Within 24hrs after the patient’s CT scan, you will receive HIPAA compliant access to CT scan, diagnostic workup, suggested treatment plan / pricing, health history, and patient preferences. 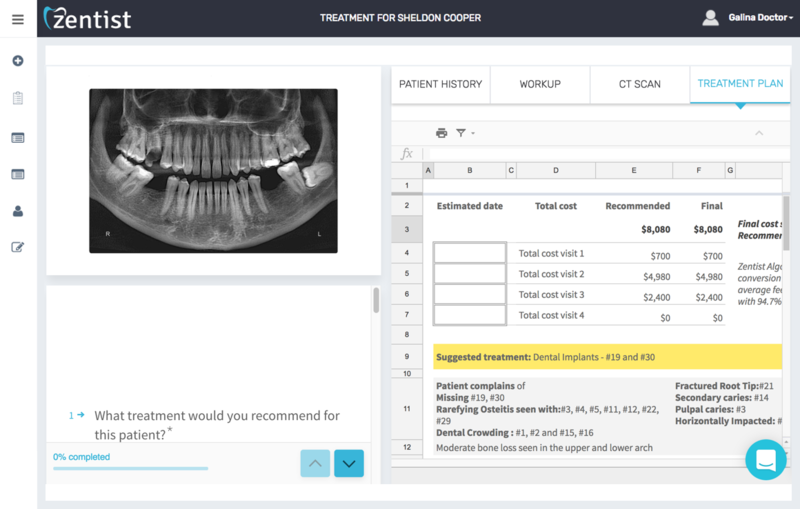 Dentists and their office staff can work together in real time to review, improve and finalize the suggested treatment plan. When done, export it to your PMS or print it out for the patient. Our administrative work has been cut in half thanks to Zentist Diagnostics. This is the only platform that keeps dental implant patients organized while saving time for both the dentist and the patient. Zentist Diagnostics has been our strongest source for CT Scans and planning. Scheduling is seamless and their suggested treatment plans are getting smarter and smarter. Zentist Diagnostics provides a 3D CT scan along with a diagnostic workup, suggested treatment plan and recommended pricing based on thousands of recent local treatments for only $199, saving an average of $320 per case. Let us take care of scheduling hassles and build detailed diagnostic and treatment plan for your patient case. Save the time you currently spend on additional in-person consultations and writing treatment plans for dental implant cases. Our Zentist Diagnostics workup and Suggested treatment plans are based on machine learning - driven medical image analysis of thousands of similar cases, improving overall treatment accuracy. We’re increasing conversion on your dental implant patient cases by 56.2% with our customized pricing for personalized treatment plans by considering average pricing based in your zip code. What kind of practices can leverage Zentist Diagnostics? Whether you are an experienced dentist or a new practice owner interested in treating implant cases, you will benefit from Zentist Diagnostics. Investment in owning CBCT equipment is high. Learning how to use the equipment and interpret images requires time and effort. We customize workup images to meet your diagnostic goals. We also have the largest data on implant pricing in each zip code. We provide customized treatment plans and make recommendations on average implant pricing for your practice to stay competitive in your area. How does Zentist Diagnostics impact dental implant cases? With our diagnostic services, dentists will improve their diagnostic accuracy and offer patients a higher level of care. With each patient case, you will be getting 3D CT scans, Diagnostic workup images and a suggested treatment plan with pricing within 24 hours of the CT appointment. You will have all the images needed for your implant cases. Do I need to train my staff to use Zentist Diagnostics? 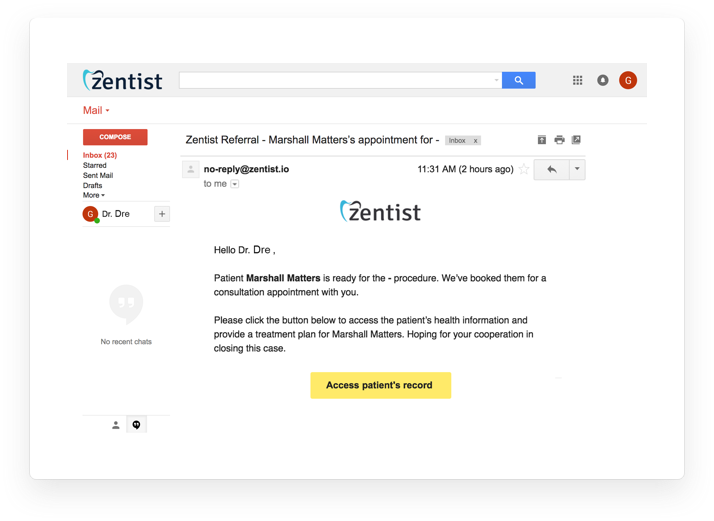 How does Zentist Diagnostics benefit my patients? We want your patients to benefit the most through convenience and improved quality of care. Our Imaging centers provides the best diagnostic services at multiple locations making it easy for patients to choose a time and place that is convenient to them. Easy scheduling and fast on-site services means improved productivity and efficient results for both dentists and the patients.